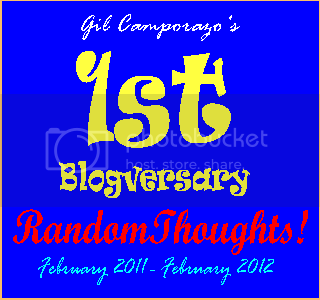 Random Thoughts of Gil Camporazo: Gil Camporazo's RandomThoughts First Blogversary! Gil Camporazo's RandomThoughts First Blogversary! It was 3rd of February 2011 when this RandomThoughts! was born. Finding faults! was the first blog I wrote as a reaction to Juana Change's video satirically "belittling President Aquino's private life." The Book of Matthew (Matthew 7:1-5) in the Bible is crystal clear why we shouldn't find other's faults, that's the foundation of my premise of support. One hundred fifty-six articles so far had been written by me and posted them here till RT reaches its first anniversary in this month of February 2012. As of this writing, 29,537 visitors registered in RandomThought's counter. At its inception, RandomThoughts' started with an Alexa rank of 15,367,892 till it improved to 2,264,171. And eventually it got its own domain through an invaluable help from C5 Ghosty Writery, a fellow blogger worldwide in December 14,2011. Now its present Alexa Rank is 612,537 with pagerank 1 in Google, which it regains after losing it when RT got its own independent domain. Thus, it took one month and 22 days to retake its pagerank of 1 on February 6, 2012. 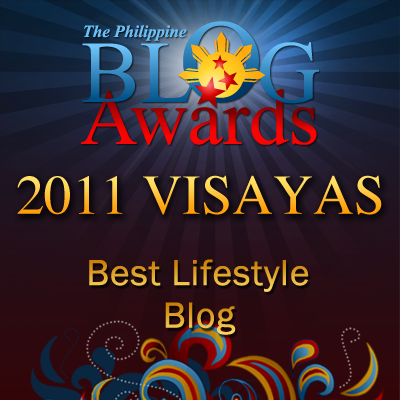 In eight months and 12 days of existence, it was recognized as the Best Blog in Lifestyle in 2011, Visayas Leg by the Philippines Blogs Award, Inc. PBA President Juned Sonido personally handed the award to me on November 12, 2011 at Silay City Museum, Negros Occidental PH. Also my newly created blog, Tumandok received also award as Best Blog in Arts and Culture award at the said awarding rites. RandomThoughts! and Tumandok were able to excel other blogger-nominees in 80% content and 20% design and usability criteria for 2011 blog award. It is my mission to blog: "It is in blogging that I share my thoughts, my experiences, my ups and downs and even my dreams for others to learn to influence or change their way of life for the better." In so doing, I'm hoping that my fellow bloggers may join me in this noble task for it is in sharing that we care. It is in caring that we love. And it is in loving that we are united. How RandomThoughts! came to being? My desire to write blog was challenged when Negros Bloggers President H. James Toga added me to Negros Bloggers closed group in Facebook. I became acquainted with the members of NB. And I sensed my belongingness with this group of students, government employees, freelance writers, businessmen, realtors, legal luminaries, news reports who belong to the core group of NB as pioneers. I followed up their blogs and I was challenged. So I said to myself: "I was defied to do my best. But of course, not to compete with them for they'd different fields of expertise." Doing my best of my own is the answer. And the rest was a history. Therefore, I wanted to share globally my blog. I submitted it to the major search engines for indexing. And it was very challenging and it took a lot of patience to wait for the results. Anyway, the results was already aforementioned. Tess Torrecampo-Chancellor, as one of the FBW admin, added me to their open group in Facebook, Filipino Bloggers Worldwide. There I gained more than a hundred friends who we're very cooperative, helpful. And I learned a lot from their unselfish tutorial and Search Engine Optimization skills and experiences. Thank you to all of you FBW members, and also to the silent or unique readers and followers of this blog. The success of this blog is faithfully dedicated to all of you. And most of all, I thank you the Lord, the Almighty who has given me the talent of writing. Of course, my wife and my family who are my avid readers and followers too are gratefully acknowledged for their moral and spiritual support. and a warm CONGRATULATIONS po! Pareho po tayo ng 1st year Celebration din po! Congratulations sir! It is an honor to meet you here in blogsphere. More power on our mission and keep on inspiring us. God Bless! Me too @Kiko, it's an honor to get acquainted with you here in blogging undertaking. Ipagpatuloy rin po ang mga kabuluhang tula at sanaysay na nagbibigay pagasa at halaga sa ating buhay. More power and God bless you. happy 1st blog anniversary! i agree sharing is caring! Yes, that's very true, @Michi. It is in sharing what we've generously to our fellow that we're indirectly or directly manifesting our care for them. Been blogging for 5 months and reading your blog inspires me to continue blogging. Thank you and continue to write meaning articles. Wow, in a year your blog have accomplished and inspired a lot. Happy Blogversary! More thoughts sir Gil!!! You have great achievements na. YOu deserve it for your thoughts are all great!!!! Happy 1st Blogversary ser! and Congratulations :) You inspire a lot. I'm happy for you ! your blog had been very informative and your comments are very meaningful . More years to gain !! Congratulations, Sir Gil. I am sure this is not the first time I'm gonna visit this blog to greet you on its blogversary. I am sure all your readers will come back each year to celebrate this very special day. Marami pang blogversary tayong pagsasamahan! You're very much welcome, @lakwatsero here. I do expect from you too your camaraderie. Let's keep on blogging for fun, information and enjoyment. Wow, congrats and happy blogoversary! You both have the awards and hits to show for it. How do you do it? I've been blogging for almost 3 years now but got less than half of your achievements! To come up with a quality blog is not easy. It takes a lot of patience, diligence and most of all, a heart and mind not only to your readers and followers but to the work itself. Next year it's your turn to celebrate yours. More power! You're already experienced blogger. For me, I need more things to improve as a newbie blogger. By the way, belated blogversary! Wow.. you won pala sa PBA 2011, sir! COngratulations po! :D Ang galing naman, meron nang award from THE prestigious PBA in just a year. Salamat sa imo nga pagtamyaw kag pagpanginbulahan sa akon kadalag-an. Ikaw mabaskog man ang imo blog. More power Ilonggo! Bravo to you Sir and congratulations for the job well done. I know how challenging it is to update post every now and then but more importantly, I also know how fulfilling it is to share ones opinion and wisdom to other bloggers and readers. Whilst others learn from our point of view, we likewise learn many things from them. I hope to read more articles from you and keep up your very best works. You're correct that is challenging and yet fulfilling to share our opinion, thoughts and wisdom to our followers, readers and even to our fellow bloggers. Thanks also for your appreciation. I wish you to keep up your best works too. Congratulations and happy Blogversary. Blogging is so much fun! We can meet new friends, new learning, and most of all we can share what we wanted to express to the world. Congrats! One year pa lang ... more years to come! Congratulations Sir Gil. You have gone a long way in just one year and I believe you still have more awards to receive and more readers to inspire through Random Thoughts. Congratulations and Happy Blogversary Sir Gil! Hoping for more years for this and for more thoughts to inspire your readers! Happy Blogversary sir Gil! Always be a blessings to others! We'll always be a vehicle or a means for others to be blessed and this is one of our intentions why we blog. I know you're also a blessing for others too!